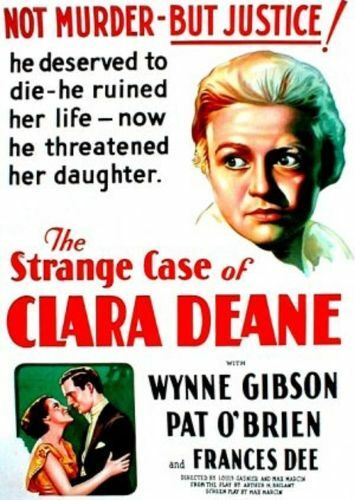 Based on a play by Arthur M. Brilant, The Case of Clara Deane stars Wynne Gibson, repeating her original Broadway role. Accused of a crime she didn't commit, young mother Clara Deane is forcibly separated from her baby daughter then coerced into surrendering all claims to the child. Fifteen years later, Clara is released from prison, as is her no-good husband Frank (Pat O'Brien). Hoping to pick up some quick cash, Frank threatens to reveal the tawdry past of his now-grown daughter Nancy (Frances Dee) to her wealthy fiancee Norman (Russell Gleason). To make certain of her daughter's future happiness, Clara shuts Frank up permanently, then turns herself over to the police. Believe it or not, after all this maudlin mother-love melodrama, there's still a happy ending in store for the long-suffering heroine.